This ring was acquired by the Museum in 1871 as part of a large collection of rings which had been assembled by the Victorian scholar Edmund Waterton. It was described at that time as a 16th-century Jewish wedding ring from Italy. 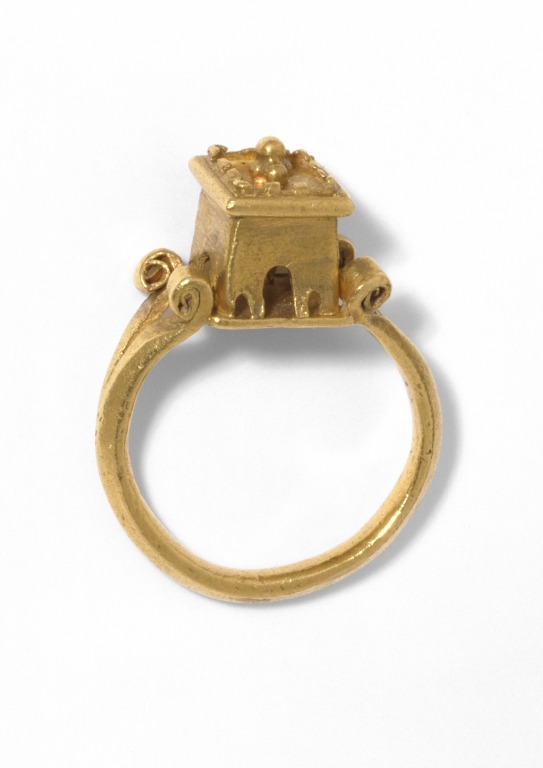 The description of Jewish marriage or betrothal ring is often applied to elaborate rings with a building, thought to represent the Temple of Solomon, as the bezel or inscribed with the Hebrew words ‘mazal tov’ (good fortune). In the 19th century they were very popular with collectors and were usually believed to be medieval or renaissance in date, although there are very few authenticated examples. This ring probably dates from the Middle Ages, but the absence of any Jewish identifying characteristics makes it difficult to be certain that it is a Jewish ring. Gold ring with a carinated shank with split shoulders ending in scrolls. The bezel is a hollow square tower with a flat projecting roof with castellation round the sides and a pyramid of granules in the centre. There is an arched opening at the base of each side, with smaller openings either side of the central one on the two sides which are not supported by the scrolls. Gold ring with split shoulders and a tower as bezel, Europe.